A benchtop drill press is a great tool both for professionals and enthusiasts. It is a powerful and versatile machine that is capable of drilling a cylindrical hole through any material, depending on your requirements. However, these machines are most commonly used for drilling through wood. When it comes to main advantages, there are a few things these units thrive in. The first thing people look in these drills is power. On top of that, most of the latest models on the market feature variable speed settings meaning you can get the same amount of torque through the entire speed range. It may not be the best thing for absolute novices due to its somewhat complex mechanisms, but a benchtop drill press is definitely something you should consider looking into, especially if you’re an avid woodworker. As mentioned, absolute beginners might have some issues along the way, when it comes to utilizing the full potential of these units. While there are a couple of light-duty models out there, the vast majority of units on the market are heavy-duty and foreseen for particularly demanding projects. In other words, you probably won’t need a benchtop press too often unless you’re dealing with wood on a daily basis. On the other hand, if you’re proficient with tools in general, getting the hang of a drill press shouldn’t be a daunting task for you at all. In fact, it’s recommended that you look into these units in case you’re looking for something sufficiently versatile and yet specific enough for your requirements. Some people don’t like the price of these as they tend to cost quite a bit. However, there is no need to worry because there are plenty of affordable models that offer similar features as the more expensive ones but for less money. The W1668 model offers quite a bit of versatility, power, and most importantly – smooth performance. It features a 3/4HP motor and 250-3050 RPM spindle speeds. The drill chuck is 5/8-inch and a 3-piece spindle sander drum kit is included as well. As you can tell, this particular machine is designed to cover most of one’s needs as long as they are within the capabilities of the integrated components. The design is pretty neat, reliable, and sturdy. The focal point of this particular drill is the tilting table which allows for versatility of applications. It can tilt at a 90-degree angle to both left and right. 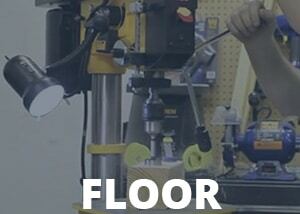 On top of that, you can adjust the height of the table to accommodate for workpiece height or sanding angles. The best thing about this table is that it can be removed in case you want to use the drill press base as a table instead. Furthermore, one of the most notable things about this model is its ability to change into a sanding unit within seconds. The best thing about it is the fact that one doesn’t need any proprietary tools in order to convert this drill into a sanding machine. All it takes is a few tool-less steps and you’re ready to go. When it comes to disadvantages, there aren’t many, but some things should be pointed out nonetheless. The first thing many people complain about is the packaging or lack thereof. In simpler words, quite a few people got their machines delivered damaged and in pieces. While it’s not a mechanical downside, it’s still important to bring this issue up so that you are aware of potential problems with shipping companies. On top of that, the user manual is quite poorly written and lacks a bunch of crucial instructions. Luckily, plenty of info is available online in case you run into issues. Wen is a well-known manufacturer of quality, yet affordable heavy-duty tools. This particular can easily power through various materials including metal, plastic, wood, and etcetera. In case you’re looking for a versatile machine that doesn’t cost much more than a handheld one, this model might be an interesting choice. It isn’t the best thing on the market by any means, but it’s definitely a thing worth looking into. The design is quite conventional, but some features aren’t a standard part of other drill press units on the market. The first thing that comes to mind is the LED screen that is designed to display the current speed so that the user is always aware of the current RPM. It might not seem like an impressive feature to many people, but you can rest assured that it comes in handy for quite a few applications, especially when it comes to processing metal. The worktable can tilt to both left and right at a 45-degree angle meaning you can perform angled cuts by simply adjusting the appropriate lever. The mechanical speed adjustment function is also worth mentioning because it allows you to adjust the speed as needed without sacrificing the torque and power output. One of the most useful things when it comes to precision and adjustability is the depth adjustment gauge located on the handle. It allows you to limit the spindle travel for higher accuracy and precision. There aren’t many shortcomings, but some things may present an issue to some people. For example, some people found it to be underpowered for some applications. On top of that, even though the manufacturer says it’s good for both heavy and light-duty tasks, it’s not entirely true. In fact, it’s a good tool for occasional projects, but you shouldn’t expect much long term. The design is quite conventional, but some features aren’t a standard part of other units on the market. The first thing that comes to mind is the LED screen that is designed to display the current speed so that the user is always aware of the current RPM. It might not seem like an impressive feature to many people, but you can rest assured that it comes in handy for quite a few applications, especially when it comes to processing metal. The worktable can tilt to both left and right at a 45-degree angle meaning you can perform angled cuts by simply adjusting the appropriate lever. The mechanical speed adjustment function is also worth mentioning because it allows you to adjust the speed as needed without sacrificing the torque and power output. One of the most useful things when it comes to precision and adjustability is the depth adjustment gauge located on the handle. It allows you to limit the spindle travel for higher accuracy and precision. This unit is a great solution for people who want a high-quality tool for an affordable price. It features a 6-amp motor which allows you to choose between five operating speeds with a range between 620 and 3100 RPM. Adjusting the height of the worktable is also quite easy thanks to the rack and pinion table elevation mechanism. As far as the design goes, there’s nothing particularly impressive about it, but that doesn’t mean it’s not good. In fact, it’s a great design because it’s easy to set up and get it running in a matter of minutes. What makes this design somewhat special is the laser. It provides accurate X and Y axis projection which allows for better positioning of the workpiece. It may not be an impressive function for DIYers, but you can rest assured that many professionals appreciate it quite a bit. The drill table tilts both to the left and right at a 45-degree angle which allows you to perform angled cuts with a single pull of a lever. The table is made of cast iron which is the go-to material for most components because it guarantees reliability and sturdiness. Not many people complained about the sheer performance of this unit, but some users did complain about quality control as well as the quality of the assembly. In other words, some units weren’t properly calibrated which consequently leads to poor performance and lousy experience. It’s a good machine for hobby work, but it can struggle with serious projects, especially if you’re a professional who uses a drill press on a daily basis. The price is good, but it could have been a bit lower. It’s not an expensive tool per se, but there are some other ones that offer similar features for a better price. However, the fact that it’s made by Craftsman adds a bit to the price. This 5-speed 10-inch press is a great tool for weekend woodworkers. It’s not an ideal solution for professionals, but it’s definitely a great thing for hobbyists who are looking for high precision and power at an affordable price. Skil is a well-known manufacturer of quality tools, and this particular one isn’t an exception. The design is quite ordinary and similar to others with a few notable exceptions. The first and most notable one is the X2 2-beam laser which ensures precise alignments. Furthermore, the depth adjustment system allows you to drill with consistency at all times. The five-speed range comes in handy in case you’re planning on handling different materials and applications. The worktable can tilt to both sides at a 45-degree angle, which is a standard feature but a useful one nonetheless. The panic stop button located on the front of the chassis is a great addition even though it doesn’t seem too impressive. While some people consider it quite irrelevant, it’s an essential feature for increased safety. One of the biggest advantages of this particular model is its X2 laser as it is not a standard feature when it comes to the affordable category. The downsides aren’t massive, but there are some things you should be aware of. The machine works well when it comes to processing wood and some other softer materials, but it underperforms with metals such as aluminum and steel. In other words, you shouldn’t expect a miraculous performance if you’re planning on processing metals. As we said, it’s a good machine for hobbyists, but it’s a poor choice for avid professionals as it is underpowered for quite a few applications. Also, the worktable tends to wobble and move, even when tightened correctly. On the other hand, the price is more than acceptable which means you are going to get what you paid for but not much more than that. If you’re looking for an entry-level machine that is easy to use yet effective enough to drill through a variety of materials, this model might be a good choice. As you can tell, it’s a somewhat miniature version of a regular benchtop drill press, but that doesn’t mean it’s not capable of coping with a variety of applications. The most notable thing when it comes to the design is its compactness. It measures 6-3/4 inches by 6-3/4 inches and weighs about 13 pounds. As you can see, it’s a small, lightweight machine which is quite easy to set up and use. It also features variable speeds of up to 8500 RPM. Therefore, the whole design revolves around the idea of being a space-saving one but still powerful enough to handle a variety of DIY projects. The biggest drawback of this design is the fact that it can’t handle massive pieces thus not being suitable for professional purposes and big projects. When it comes to the shortcomings, there aren’t many besides the obvious lack of ability to cope with bigger projects. The unit also often struggles with accuracy and power. Many people complain about the poor performance, but it’s not quite fair in the first place as this machine isn’t foreseen for serious projects. As we mentioned, it’s an entry-level tool and you shouldn’t expect too much from it in the first place. The chuck tends to get loose and wobble occasionally, but it’s not a big deal as it’s easy to readjust it in a matter of seconds. It is an okay machine, but far from an ideal one. The unit is more or less fairly priced, although some people consider it to be expensive. It all comes down to one’s personal preferences, but if you’re looking for heavy-duty tools, this one isn’t a good choice at all. Before You Buy: How a Benchtop Drill Press Works? Before you decide in which model you want to invest in, it’s a good idea to do a bit of research and get familiar with the basic principles and mechanisms on which these tools work. Many people decide to neglect this particular step and most of them consequently end up buying something that is either not worth the money or it doesn’t meet their expectations. In order to get the best possible deal, you should at least know how a benchtop drill press works. Most models use electricity as a source of power. There were some attempts by a few manufacturers at building a battery-powered unit, but it didn’t end up being a good idea at all, especially because cordless units aren’t able to output as much power in order to process tough materials with high precision and accuracy. Therefore, if you stumble upon a cordless model, it’s better not to consider investing in it as it’s probably not nearly as powerful as a corded one. The motor is usually located at the top of the unit. Some come enclosed while some don’t. It’s not a game-breaking thing by any means, but the exposed motors are slightly better because they cool off faster than the enclosed ones. Most of these units work on a belt and pulley principle. In other words, there are two rotating discs enclosed in a casing that are driven by the motor and transfer power via belts. It’s a pretty straightforward mechanism, although there are some that are slightly more complex. When it comes to motor power, it varies from model to model. As far as recommendations go, one shouldn’t invest in a unit that has less than 5-6 amps of power as they are regarded as underpowered. In order to get the best possible deal, one has to get familiar with the do’s and don’ts. It is essential that you are aware of what makes a drill press worth investing in or else you’ll end up buying something that won’t meet your expectations. In case you want to get familiar with the variety of aspects when it comes to these drills, make sure to keep reading this buyer’s guide and you’ll get a much better idea of what to look for and what to avoid. As one can assume, the more power a unit features, the more it can handle. However, that doesn’t mean you should buy the most powerful unit on the market and call it a day. The key is in finding the balance between your requirements and the offers on the market. Therefore, if you’re an avid professional, it’s probably a good idea to invest in a powerful heavy-duty unit. On the other hand, if you’re an occasional user, power is probably not the first thing you should think about. Keep in mind, even if you’re not an avid user of these tools that doesn’t mean you should get an underpowered unit. When it comes to recommended and acceptable values, a 6-amp motor should offer more than enough power for the vast variety of applications. Anything less than that might cause some issues along the way, although it’s not a rule of thumb by any means. People typically follow other user’s recommendations, but that’s not always a proper strategy because different people look for different applications. In simpler terms, instead of following someone else’s recommendations, try coming up with your own. While ergonomics aren’t a factor here, there are some things you should keep in mind when it comes to the design of these tools. For example, the base should be made of sturdy materials, preferably steel. This particular factor is somewhat essential because the quality of the base has a massive impact on the overall stability of the unit. Furthermore, you should aim to find a unit that is made of reliable materials. That means you should avoid models that feature too many components made of hard plastic because it’s subpar in comparison to metal. Now, that doesn’t mean that your unit shouldn’t contain any plastic parts, but it should be minimal. The price or a particular model is usually associated with the overall quality, which is not entirely correct or true. In simpler words, if something is expensive, that doesn’t mean it’s proportionally better in comparison to some cheaper units. In fact, most models that are particularly expensive offer very similar features as the cheaper units but are made by well-known brands which automatically guarantees better warranty conditions, quality control, and most importantly – customer support service. In other words, if you opt for a well-known brand, you can expect great service, but you should also expect a much higher price. The key is in finding the balance between a good price and a quality product. The market is quite saturated with all sorts of different units, and most of them simply aren’t worth investing in. It’s quite a dangerous thing for inexperienced buyers and that’s why it’s important that you make a fine parallel between a good price and acceptable quality. While additional features do affect the overall price of the product, there are some you should aim to get. For example, a model with an integrated LED light is strongly recommended both for professionals and DIYers. It doesn’t seem like a massive advantage, but you can rest assured that it helps a lot. On top of that, some units feature an LCD that shows the current RPM values. Occasional users usually don’t need this type of feature, but professionals appreciate it quite a bit. A benchtop drill press is a great tool because it’s versatile enough to act as a substitute for many handheld tools. It’s not a complex machine per se, but it does require some basic knowledge. Most models can cope with a variety of materials including metal and plastic, but the vast majority of these drills are foreseen for woodworking purposes. The price varies greatly depending on what you’re looking for. There are some units that cost up to several hundreds of dollars, while others cost much less. As we said, it all depends on what you need and want. When it comes to recommended models, there isn’t a definite list of these because, once again, it depends on the user’s requirements and needs. In case you want to read a more in-depth analysis of the units we chose to cover, don’t hesitate to check our full reviews out. On top of that, if you’re struggling to find an appropriate unit for your needs, refer to our buyer’s guide and it might give you a better insight into the essential and important elements one should be looking for in these tools.